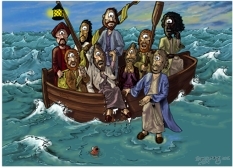 Jesus the Christ is standing on the lake water, hand on the boat’s gun wale, waiting to get on board the boat. I really enjoyed drawing this scene, particularly all the water coming off Simon/Peter in huge drops! A note about facial expressions. There are quite a few different facial expressions to note in this scene: Judas Iscariot has one lowered eyebrow & is looking a bit scornfully at Jesus. Thomas/Didymus (”Doubting Thomas”, standing behind the mast) is looking less doubtful, with open-eyes, but is still doubting! John & Matthew/Levi are both praying with hands together & looking wonderingly at Jesus. Notice that Matthew/Levi’s seasickness (the green tinge to his skin from previous scenes) has finally left him too! James (holding up one of the oars) is looking with wide-eyed wonder & admiration. Philip (on the tiller or (rudder bar) has open-eyed & open-mouthed amazement written all over his face! Simon/Peter has a bewildered expression of awe, fear, amazement whilst his brother Andrew is wide-eyed with wonder mixed with shock. 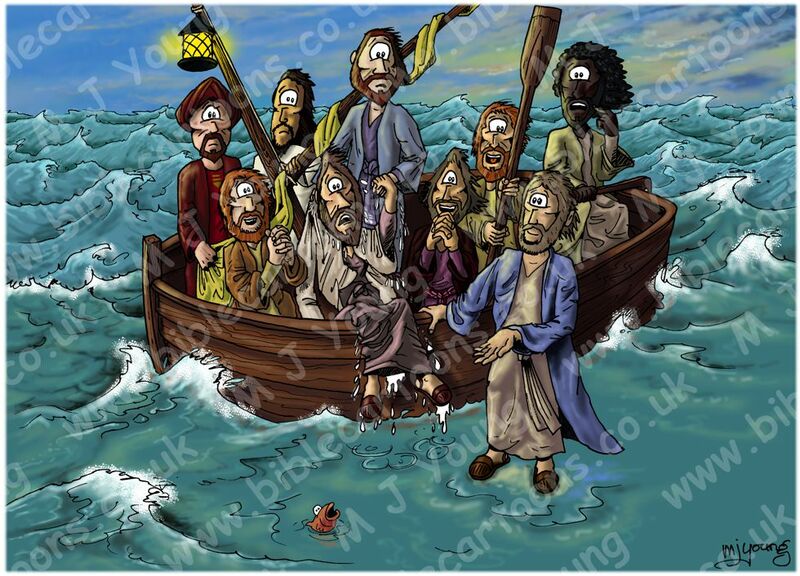 Jesus is the only one looking calm & confident, as you’d expect! He loves his disciples, regardless of their performance.